Has anyone made progress? 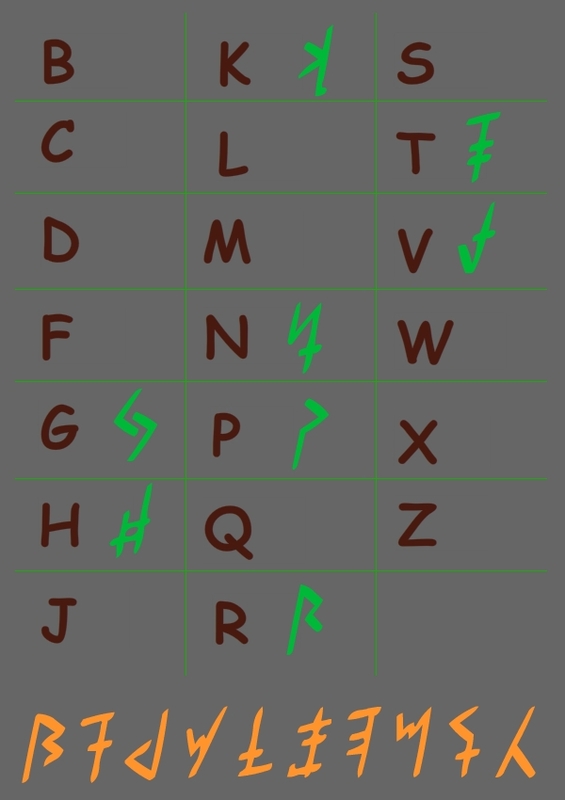 I haven't really gone for solving the runes, but I have been trying to figure out the numbers still. I have a project deadline coming up, and had to set this aside. I haven't given up, but it'll be a few more days before I can spend time on this again. However, even before that I had kind of hit a dead end, and I'm not optimistic that I'll get anywhere when I start up again. I think I might have just solved A and it just says happy Halloween. there's no vowels, including y, and the : is double letters. Is that right, @Anukan ? That fits, yeah. Still curious about the numbers and tumblr though. The Halloween theme went up almost 2 years to the day Oleander's book of lore went up. Coincidence? Or did they celebrate their anniversary with evil puzzles? Do you know what day her lore went up? Dated 17/10/15. Forum announcement for the theme is 16/10/17. I think I might have just solved A and it just says happy Halloween. there's no vowels, including y, and the : is double letters.? This is so cool, I think you must be on the right track. Just an observation: if the third line, second-to-last rune is "D" to make oLeaNDeR, then the second line, last rune is probably not "D", even if it looks like a lower-case "d." (None of the others seems to bother with case). So the last part of the second line is probably not "day." Since most of the runes looks kind of like the letters they represent, what else does that last one on the second line look like besides a lower-case "d"? "J" or "V" maybe? Or a backwards "b"? "a total desertion of or departure from one's religion, principles, party, cause, etc." ...which totally fits with Ollie's lore. So,"Happy Apostacy FHTNG & Oleander"? (for that to work, you have to spell "apostacy" the British way, with a "c", not the American way as "apostasy" because that would mean two different runes map to "s"). More likely than either of these, though, is that P?T? is two words. Wait, I might be overthinking it. Alvegor suggested "Pact Day" (I can't seem to quote from the edit screen). It could be as simple as "PaCT By". So, "Happy Pact by FHTNG & Oleander"
Okay, no more edits. I'm done for the night. I look forward to seeing what everyone else comes up with. Did he actually get it right!? Gaaah, I don't know if I should look at the spoiler or not! Also, there's still a little of the 2nd/3rd code and the Tumblr password to figure out. Oh, I was worried he was going to spoil the whole thing before we'd figured it out. But he's just teasing us as usual! @ty4brawl I'm sure you cracked it, basically. Genius solution, man. We just need to get the details ironed out. Thanks. And yeah, we've just got to figure out the last of it and figure out how it connects to the Tumblr, if at all. Still curious about the numbers as well, but that's still pretty hard to solve. And looks like I'm gonna start heading back onto the search. I guess we're calling the language Foenician? I like the way that sounds I'll keep you guys posted with anything I find! Where are those from? Have you tried plugging in my solution? Can we also get a list of the known letters so we don't plug them in? Alright guys! I got your runes. Get @ty4brawl and @Flame a sandwich. Okay, I'll just go quickly! You know, speedrun it and stuff. So we have them together. To hopefully make things easier. Sorry for double post. Alright back! Here's your sandwiches guys! Collecc dusty (totally not haunted) booccs of Ancient Foenician Literature for Spooky Dude . My notes so far. Yes I wrote all the runes out and put what my recipe said they were. Just gotta figure out the new runes, if @Anukan changed any of them, and insert vowels. I'm just thinking... Could each symbol correspond to a phonetic sound rather than a letter? The world is Foenum (don't judge me, my phone won't let me link vowels), so that might hint towards the answer. Or I'm digging too deep. Too deep. We went down that road awhile ago. I did add the n I missed prior to taking the picture. Will try my hand at this after work. Might take a better picture later too. Any progress? I haven't ended up looking at it much. Also, pretty sure it starts with an & since it has the same thing that separated Oli and Fred in the 2/3 rune puzzle. Not sure. Still haven't gone at it and it's Christmas crunch time, so may not get it till after. I have faith one of you guys can figure it out. I guess it's possible, but he would have switched some rune designs. Not sure about the apostrophe either. Just a reminder, we have all the rune pictures saved to this album in imgur. Does not include some of the glyphs from previous puzzle since they could have been changed. You absolute genius. I love this chart. I guess most of us here could come together upon the game release to figure out and translate hidden lore there might be. This was needed very much. You amazing person.